As we announced in our last blog post, our event with the Advocating Classical Education project is just around the corner. We’re now very excited to reveal the programme for the afternoon! If you’re interested in attending the event through our live-streaming platform, see our previous post for contact details for an initial registration of interest. More details about what to expect from each session, and how to join in on the day, will be available soon – watch this space! This entry was posted in Outreach and Engagement, Teaching, Uncategorised on February 11, 2018 by Joanna Paul. Save the date for our live-streamed ACE event! The Classical Studies department at the Open University is pleased to announce our upcoming ACE event on the 12th of March 2018, 2-5 pm. This event is unique in the ACE programme for being live-streamed and open to any school groups or teachers, across the UK, to attend remotely. As part of the AHRC-funded project, Advocating Classical Education, this public partnership event will feature a range of talks and activities promoting the study of Classical Civilisation. We are lucky to have Professor Mary Beard, undoubtedly the best-known Classicist in the country, joining us: Professor Beard will speak on the importance of Classical Studies in her life and career, and will also participate in a Classics-themed ‘Question Time’. 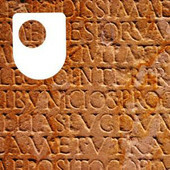 The event will include talks and interactive sessions from Open University academics on their own research, guidance for teachers on introducing Classical Civilisation to the curriculum, and an introduction to the wide range of open access resources provided by the OU. Full programme details will be published very shortly. The entire event will be live-streamed, and will include interactive features enabling our online audience to participate remotely – asking questions, joining in quizzes, and adding your comments to proceedings. Schools or teachers interested in participating in the event online should contact one of the event organisers, Virginia Campbell (virginia.campbell@open.ac.uk) for more information. This entry was posted in Outreach and Engagement, Teaching on February 2, 2018 by Joanna Paul. In this post, we share with you the text of an article that was published in the Classics journal ‘Greece and Rome’ in 1974, just five years after The Open University received its Royal Charter. It was penned by John Ferguson, the first Dean of the OU Arts Faculty; prior to this appointment, Ferguson had been teaching Classics at the University of Ibadan. The article introduces the OU to an audience of fellow classicists who were teaching at ‘conventional’ institutions: hence Ferguson starts by explaining the OU’s mission, before moving on to discuss, with great frankness, some of the practical and academic considerations that shaped the new Faculty and the earliest Classical Studies curriculum. We are very grateful to Cambridge University Press and the editors of ‘Greece and Rome’ for allowing us to reproduce the full text of this article on our blog – a fascinating insight into the early history of our subject area! 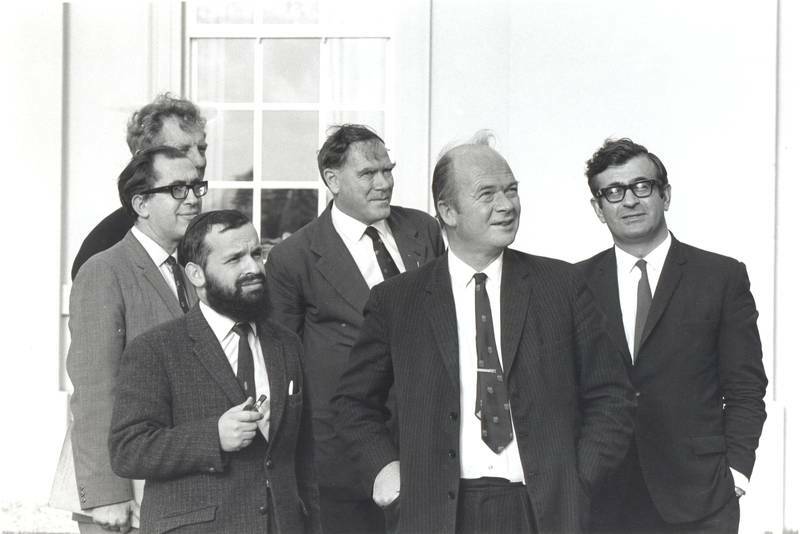 Pioneers of the OU: showing (from left to right) Mike Pentz, first Dean of Science; Geoffrey Holister, first Dean of Technology; Maxim Bruckheimer, first Dean of Mathematics; John Ferguson, first Dean of Arts; Walter Perry, first Vice-Chancellor; and Anastasias Christodoulou, first University Secretary. “The Open University received its charter in July 1969, offered its first courses in January 1971, and produced its first graduates (with some ‘credit exemptions’) by the end of 1972. Those who originally planned it saw that many people who for various reasons missed their opportunity of university education at the usual stage of their lives could profit from it, provided that what was offered was home-based study in spare time. They saw too that radio and television offered an excellent opportunity for helping such study to be direct and personal. Students then are admitted with no entry qualification except the age of 21. We have built a few parameters into our selection procedure; we can control the proportion admitted to any one foundation course or from any one region of the country for example; but basically it is ‘First come, first served’. Typical students are the boy who has been to a poor school, has never been turned on, has left at the age of 15 and gone into industry, and in his twenties has suddenly become excited by what he is doing and at the same time has revealed a keen mind; the girl who with decent A levels has got married at 18, sees her family growing up, is aware that she has time for some study while they are at school, and will be able to take a full-time job in three or four years; the long-term prisoner needing a constructive occupation in prison and qualification for when he comes out; the working-class lad who has entered the police force and, by ability and application, has worked his way up from the beat; the retired industrial worker or bank manager who wants a positive purpose in his retirement; the teacher who has no degree, perhaps because the family could not afford more than a two-year course, and seeks more knowledge in his subject, as well as the increment applicable to a degree; the person well settled in one profession who would like to qualify for a second career before giving up the first; the taxi-driver who is interested in people and ideas, and wants to know what it is all about. We have them all, and many others. The Planning Committee, a body which included most of the country’s leading educationalists and no politicians, decided for three reasons that the basic courses should be of a new kind, and should be an attempt at an integrated or inter-disciplinary approach. For, first, they thought that the seamless web of learning had become too tattered, and that we were not even seeing the shreds in context. Secondly, they thought that if we were attracting the sort of students we should attract, there would be many who would have a general sense that they wanted to work in the humanities, but might not know exactly which aspect of the humanities interested them. Even more they might (for instance) think that they wanted to study history or literature, and might never dream of trying philosophy or art history unless they had had the opportunity of an earlier sample. Thirdly, operational constraints conspired to make our basic courses large in numbers. The main constraints here were the limited amount of air time available, which meant that it would not be possible to have basic courses in all the familiar university disciplines, and money, for the Open University had to establish itself on a ‘cost-effective’ basis. The pessimistic prophecies of an 80 per cent drop out have not been fulfilled; in fact in the first year we had an 80 per cent pass rate in Arts. But when we started no one knew what the results would be, and we had to be cost-effective even on the most pessimistic prognostication. When I was appointed Dean of Arts in 1968 I was asked to name four areas in which professors should be appointed. I named history, literature, the whole area of thought (philosophy and religion), and the fine arts. It is important to see that these are not departments, and we have resisted any tendency towards a departmental organization. We did not seek at this stage to develop languages, dead or alive. There were a variety of reasons for this. First, the problems of teaching languages at a distance were quite different from any of the other problems we were facing, and we had enough problems as it was. Secondly, those who wanted courses in languages were reasonably well catered for, by the BBC, by Linguaphone, and, in the main centres of population, by evening classes. Thirdly, languages did not fit easily into the emergent pattern of basic courses, which were strongly integrated, and the amount of any one language one could have mastered as a fraction of the foundation course would not have been worth while. Fourthly, while there was general agreement that language courses should be geared in to communication, i.e. reading and writing, there was controversy whether such courses were properly part of a University degree. Languages remain one competitor for University expansion, but it is unlikely that the classical languages will have any high priority. In the meantime work on classical and foreign texts is done in translation. Originally there were four faculties, Arts, Social Science, Science, and Mathematics. Since then we have added Technology, and Education (which does not offer a Foundation Course). Graduation is on six credits, a credit representing the successful completion of a course which runs for the whole of an academic year. Students are not permitted to take more than two credits in one year. Since the first year we have added some half-credit courses, but do not intend to have any of lower denomination. This system has the flexibility of the American system without its fragmentation, the structure of the English system without its rigidity. Students are required (unless they are accorded a ‘credit-exemption’ in acknowledgement of study already achieved at a University level) to take two Foundation Courses. They must therefore do some work in more than one faculty. But we have not bridged Sir Charles Snow’s two cultures. The majority of our original 20,000 students, and of the 48,000 we have since admitted, have tended to combine the science-based subjects or the arts-based subjects, though the figure of perhaps 200 a year who combine science and arts, small in proportion, is not absolutely negligible. The Planning Committee assumed that faculties would extend the integrated approach to the ‘second level’, and that the majority of students would graduate without going beyond second level. Specialist courses would begin at third level, and students would convert ‘general’ degrees to ‘honours’ degrees by the addition of two such specialist courses. The Arts Faculty has in fact continued integrated courses into the second level, but it is already clear that some students will take specialist courses at third level as part of their original six credits, and it is a strength of the system that they can do so. At the same time the specialist courses continue the element of integration: the literature course on The Nineteenth Century Novel looks at the historical and social background and parallel developments in the other arts, the history course on War and Society looks at the impact of war upon literature, music, the arts, and religion. The first courses ran for 36 teaching weeks. This was reduced first to 34, and later to 32. In addition, for all science courses, for all foundation courses, and for most other courses there is a week’s intensive summer school. There is also a revision period and an examination. Students are expected to put in about twelve hours a week on a course, though some put in appreciably more. Students are assumed to be home-based. There are study-centres in the main centres of population, where they can meet with other students and with tutors (academic) and counsellors (general advisers). The basic course-material is centrally prepared and sent to them at regular intervals. It consists of beautifully printed, well-illustrated booklets. We have tried to design them so that they are strongly personal and conversational, and form a kind of dialogue between reader and writer. We invite a student to make responses, and then read on as if we were commenting on his response. Students are required to purchase some books, and these are negotiated with publishers, so that they are kept in print, and are as cheap as possible. Some of these are specially published for the course (which has a guaranteed life of four years). At foundation level there is a weekly television and weekly radio programme; at later levels these may be less frequent. They form an important bridge for some students between the familiar means of comunication and the less familiar involvement with the written word. They enable students to see what we look like and to hear our voices. They enable us to introduce eminent specialists from all over the world. They are essential to visual and auditory experience, as in drama and music. And they have a variety of other uses. Written work is corrected by part-time tutors. Students are assessed on their written work, with one three-hour exam at the end of each course to add confirmation. The Foundation Course in Arts is entitled ‘Humanities: An Introduction’. It is frankly a compromise, one worked out through many months of patient negotiation, between a variety of sometimes conflicting opinions and interests. Sometimes it achieves an integrated approach; sometimes it is interdisciplinary; sometimes it is merely multidisciplinary. After an introduction (originally 4 weeks, now 2) each of the disciplines, history, literature, art history, music, exposes its wares. Then follows a series of case-studies (one of which, on Descartes, is effectively an introduction to philosophy), each lasting two weeks, and an extended eight-week-long case-study on ‘Industrialization and Culture’. An introduction to logic runs concurrently with the first half of the course. Part of the introduction is an attempt to raise some questions about the relation between technology, society, and the arts. In raising these questions I take off from two famous passages in Greek tragedy, the long speech in which Prometheus outlines man’s indebtedness to him for the gift of fire, and the chorus in Antigone which sings of man’s achievements and his limitations. So that at the outset students become aware of classical literature. When we discussed the case-studies, we felt that they should enable students to apply the techniques of critical analysis which they were beginning to learn; they should where possible be inter-disciplinary; and they should open up aspects of our inheritance of which students should be aware. I was therefore insistent that one case-study should link with our classical heritage and one with our Christian heritage. For the first we chose Socrates. C. F. Angus used to describe him as one of the three most fascinating personalities who ever lived, and the only one who was not worshipped as divine (the others being Jesus and Gautama the Buddha). It was this aspect we decided to concentrate on. We did not treat Socrates primarily philosophically, partly because I do not believe that the Theory of Forms pertains to Socrates (what a lot of Vlastos’s recent collection of essays on Socrates is really about Plato! ), partly because this would in any case form part of a third-level philosophy course, partly because they had not yet had their philosophical grounding. But of course there are inescapable links with philosophy. What there is also is a fascinating problem in source-criticism. To this end I compiled a source-book on Socrates. I had often needed one for teaching in the past, and was glad to compile one. As it has met with criticism from the reviewers, a comment or two may not come amiss. It is an attempt to present all the evidence (Plato and Xenophon being represented by key-passages only) about Socrates. Many of the criticisms I accept. It had to be done in an extreme hurry, and we had, with one exception, to use out-of-copyright translations because there was no time to negotiate copyright. I missed one important passage in pseudo-Lysias (though no reviewer has in fact mentioned this), and am now persuaded that I mistranslated one Aristotle passage. But this was a source-book for students, and I do not agree that it should have had the sort of index which does students’ work for them. Of course in the later passages about Socrates there is a lot of dead wood, Stoic or Cynic moralizing, trivial anecdotes, and the like. But these late writers still had access to Aeschines of Sphettus, and perhaps other contemporary writers. No one has really asked what information they may yield, and it was not the book’s purpose to anticipate such conclusions. We were able, because of the magnitude of the O.U. operation, to put out nearly 400 double-column pages, including the first-ever translation into English of Libanius’s Defence of Socrates, for 42p. The course-units (entitled Which was Socrates?) then are an invitation to evaluate the source-material, with a sketch of the historical background. The first radio programme is a talk with illustrative excerpts showing the problem of the principal sources. The second is a philosophical discussion between Renford Bambrough and Godfrey Vesey of the significance of the Socratic ‘universals’ for modern philosophy. The first TV programme is a presentation of the key-passages of The Clouds in conditions as near to the original as we can get in the studio. This is after all our only primary source for that period of Socrates’s life, and it is important to see it as drama, comic drama, and low comic drama. The masks incidentally, brilliantly designed, formed a problem in the heat of the studio. A second programme discusses the point of the first. Altogether we wanted students to feel the impact of Socrates the man. One of the more moving letters I have received came from a tutor in the Isle of Wight to say what a therapeutic effect the Socrates units had had on long-time prisoners in Parkhurst gaol! After Socrates come two units entitled What is a Gospel? It is a study of the compilation, writing, nature, and tradition of The Gospel according to Mark, again with a sketch of the historical background. It seemed a good idea to expose students to two of Angus’s three seminal personalities in swift succession. It has made possible an interesting assignment, ‘Compare the reasons for executing Socrates with those for executing Jesus’. The exposition is naturally open, historical and philosophical, not dogmatic. At the second level we apply the integrated approach to period studies. Our two main courses are Renaissance and Reformation and The Age of Revolutions. Included in the first are a couple of units on the classical and mediaeval inheritance, and in them I discuss Renaissance humanism against its classical background. The associated radio programmes are a portrait of Petrarch as a humanist, and an exposition of Platonism as an essential backcloth to Renaissance art and thought. There is one television programme, made in colour, an exploration of the neo-Platonism underlying some of Botticelli’s paintings. Obviously also the account of Florentine art and architecture includes their indebtedness to classical principles and classical originals. The Age of Revolutions naturally has less classical involvement, but Jefferson’s architecture is deeply rooted in the ancient world, as are many of the ideas of the French and American revolutions, and the High Art of the period (not least that of David) has important classical references. In addition to these we have begun to develop courses in the history of science; I suspect that I am the only Dean of Arts in the country with four chemists on his staff. One of the first two half-credits, Science and Belief from Copernicus to Darwin, includes a certain amount of material on the Aristotelian and Ptolemaic world-pictures, and on Renaissance neo-Platonism; I have contributed a radio programme on the Cambridge Platonists. A projected course on The History of Mathematics will contain a considerable body of material on Greek mathematics. We have recently taken the decision to augment our second-level courses with two half-credits on classical civilization. The first of these, The Early Roman Empire and the Rise of Christianity, will be available in 1974. We have taken as notional dates A.D. 14-138, not without considerable heart-searching. But the reign of Augustus has two serious disadvantages for our purposes: the primary sources are too limited, scattered, and varied, and the literature is too bulky for a half- credit course; and the late Republic really does need more of Cicero’s speeches than are readily available in translation outside the too ex- pensive Loeb. The more we looked, the more the early Empire had to commend it, the emergence of the pax Romana, the rise of Christianity, Tacitus as a primary source, the climax of satire, moral philosophy represented by Seneca, the first serious invasion of Britain, plenty of material on social life, Pompeii and Herculaneum, portrait busts. So we shaped the course. We were fortunate in persuading J. P. V. D. Balsdon to join us as a consultant to write the basic history units; he quickly fell in with our unfamiliar approach to presentation without losing his own pungent style. These units are associated with television programmes on ‘The Roman Army’ by Michael Jarrett, and on ‘Image of Empire’ (a study in imperial propaganda) by myself, and radio programmes from Michael Grant and A. N. Sherwin-White. Then come two units on moral philosophy, using Seneca’s letters as a basis; the radio programmes are a dramatic presentation, entertainingly acted, of Lucian’s Philosophies for Sale, and a talk, with dramatic illustrations, on the Stoicism in Seneca’s tragedies. Next come two units on satire, Petronius and Juvenal unexpurgated. (When these are put together with our somewhat phallic version of The Clouds I shall have acquired a high reputation for immoralism!) The radio programmes are a dramatization of the Ludus de morte Claudii, and a talk on Martial, illustrated by ample quotation. Then two learned units on Roman art by Catherine King, one of our History of Art lecturers. This has associated with it television programmes on Roman domestic architecture and Roman portraits, and radio programmes on urbanism and Roman building. Then two units on social life, which Balsdon and I have shared. The television programme treats the Romans at work and the radio programmes the imperial elites, and the School of Rhetoric. Peter Salway has a single unit on Roman Britain with a television programme in which he looks at Fishbourne and Bath with Barry Cunliffe, and a radio programme on the Britons under Rome. Finally, a block of four units treats the rise of Christianity. Dr. Francis Clark together with the staff tutor, Revd. D. A. T. Thomas, is responsible for these. The first television programme shows Christianity among other religions; I have done this; the other is the first television film shot under St. Peter’s. Set books for the course include Penguin or Mentor translations of Tacitus’s Annals, Seneca (Letters from a Stoic), Petronius and Juvenal, the New Testament and the Apostolic Fathers, as well as the appropriate volume of Lewis and Reinhold for primary sources. A very proper limit of essential expenditure to £9 for a half-course constricts our secondary sources. Salmon and Filson between them cover the history, and Wheeler the art and architecture. At the time I write it looks as if there will be an initial registration of slightly under I,000 for this course. We hope to complement this with a half-course on Greece 450-350 B.C., though this may not be available before 1978. The present plan, which may be modified, is that the course will contain, interspersed with each other, four units on history, four on literature, four on philosophy, and four on art. The dates are notional, and may be stretched slightly in either direction. The literature is likely to concentrate on drama. We hope to take The Oresteia, and perhaps the two Electra plays, and an Aristophanes, perhaps (as Douglass Parker calls it) The Congresswomen, which fits in pleasantly with the philosophy and the political history, and is beginning to point forward to New Comedy. For the philosophy we shall probably do a double-unit on The Republic and another on The Ethics (to end the course). The art units are not yet planned, but Peter Salway will probably treat the Acropolis, and we shall surely need units on vase-painting and sculpture. Professor Gerald Fowler, who held a university post in ancient history, before entering first practical and then theoretical politics, will be a member of the course team; three regional staff with classical interests, Peter Salway, David Sewart, and Ian Howarth, have expressed a readiness to be involved, as has Mrs. Jennie Potter, the former Newnham scholar, whose husband holds an O.U. post; we hope that one of our art historians will contribute, and perhaps also one of our philosophers. 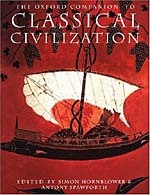 The two together should form an attractive introduction to classical civilization. Meantime, there is an important classical contribution to the gradually emerging third-level specialist courses. Indeed, I have a strong conviction that one of the most important things for classical scholars to do is to make their contribution to a fresh synthesis in this way. Thus I have written a unit on Thucydides and the Peloponnesian War for the history course War and Society; a unit on Plato’s Theory of Forms for Problems of Philosophy; and am in process of contributing study material on Alcestis, The Bacchae, Oedipus the King, and Oedipus at Colonus to The Basis of Modern European Drama, and on Greek and Roman religion to Man’s Religious Quest. Nb. the original article contains an appendix containing the times of transmission for 1974 of the programmes referred to above. All television programmes were on BBC2 and all radio programmes on Radio 3 VHF. This entry was posted in History of the OU, People, Teaching on August 18, 2017 by Jessica Hughes. Many of you know Mair and the enthusiasm she has for reminding us that Latin was, and can be, a real language, more than grammar grind and reading a bunch of fusty old texts…! 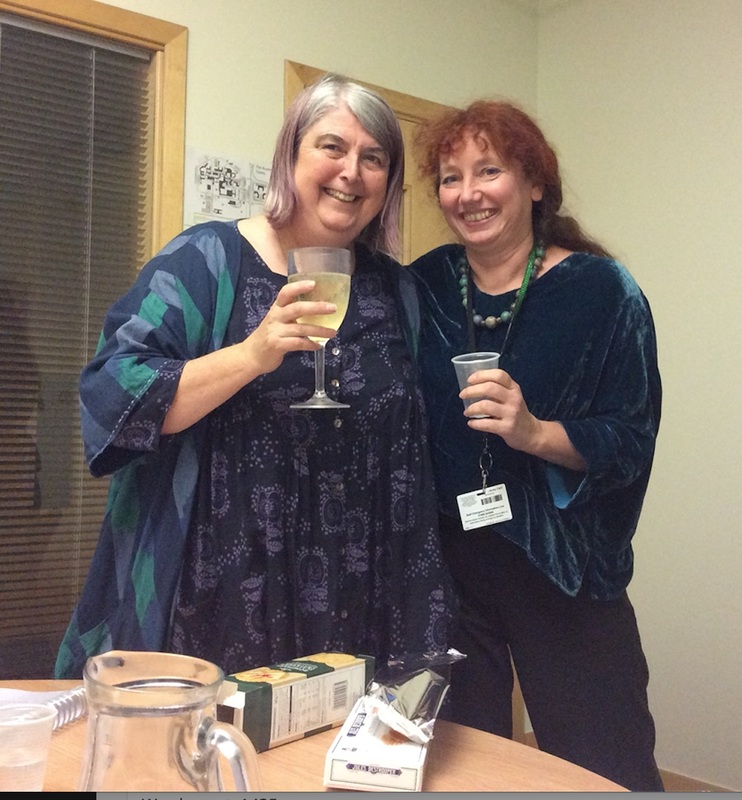 I hope you’ll join with me and Mair’s other supervisors – Regine Hampel, Uschi Stickler, Linda Murphy – in congratulating Mair on her amazing achievement of winning the prestigious AOUG Vice-Chancellor Sir John Daniel Award for Education and Language Studies (2016). Mair, with her enthusiasm and dedication, has bridged boundaries and brought a lot of people and ideas together. By sharing supervision between the Classical Studies and Modern Languages departments we have learned much from each other (and the ways we work with language and think about language). By asking pertinent questions in her research, Mair has made Latinists across the country aware of the value of technology for teaching and learning, and by travelling to the US and participating in a Latin immersion course as a student, Mair has herself experienced the power of Living Latin for real communication. The award Mair has received is in the name of Sir John Daniel, an educator who has always encouraged the use of technology, and promoted learning in unconventional ways and places, so it is quite fitting! 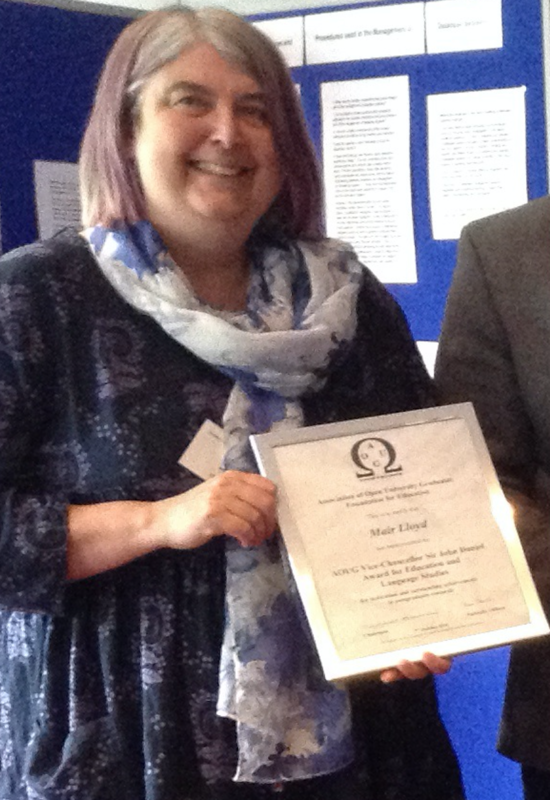 Mair’s research is about making learning better and more enjoyable. She has discovered that ‘good Latin learners’ read with engagement and with fluency, and has demonstrated that Latin is a language that can be brought to life and can be used. #CA16@MairLloyd is absolutely brilliant. There are many layers to language learning. Learners can help each other in the process. The Living Latin panel. It has been mind-blowing. And we all spoke some Latin! Mair’s exploration of learning to read in Latin has highlighted aspects of reading that have not been extensively explored in modern languages either – i.e. exploring reading with comprehension in the target language without resorting to translation or checking unknown vocabulary, and reading with engagement. She has used an innovative approach to evaluation of this type of reading that includes reading and drawing. Her research has been far more extensive than that which is presented in her final thesis, and she will be submitting a range of further papers and conference presentations outlining findings related to learning of Ancient Greek and the development of interaction and collaborative Latin learning through Information and Communication Technology. Mair’s thesis, Living Latin: Exploring the communicative approach to Latin teaching through a sociocultural perspective on Latin learning, is an investigation of the current approach to the ab initio teaching of Latin in Classics departments in UK universities and how this aligns with the aims and aspirations of students. Drawing on Second Language Acquisition theory and practice in Modern Language teaching she has examined how the implementation of methods and activities based on a communicative approach to Latin teaching can help students to attain their ab initio Latin-learning goals. She then explored the explanatory value of a Vygotskian sociocultural theoretical perspective (as applied to modern language learning) in the analysis of learning events during communicative Latin teaching and interpersonal interaction in Latin. The research forges new links between the Department of Classical Studies and the Department of Languages. Mair came to the research having noticed her own difficulties as a beginner getting to grips with reading Latin, compared with the faster progress she felt that she had made as a beginner learner of French. She intuitively felt that the more interactive use of French might actually be helping her to read more easily in French, and that Modern Language theory and practice might have some benefits in the teaching of Latin. Like many learners of Latin and their teachers, her aim was to be able to read and enjoy original texts in order to be able to gain insight into and appreciate the life and perspectives of the writer and the ancient world. 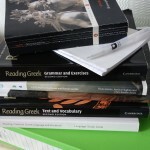 Although a number of classicists have previously looked to Modern Language theory and pedagogy to inspire their approach to Latin teaching, Mair has established that little or no attention has been paid to demonstrating the benefits of these approaches for Latin teaching or determining how well their effects are explained by language learning theories. The results of her survey of UK University Classics departments showed no evidence of awareness of curricula underpinned by theoretical positions. 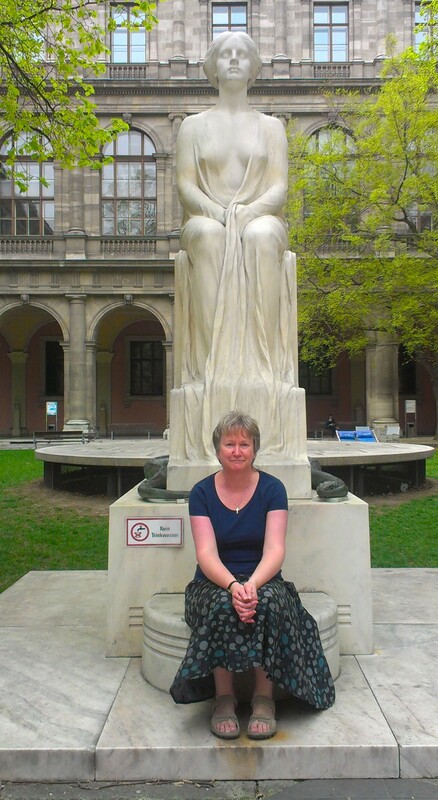 Despite having no previous knowledge of language learning theories herself before beginning her research, Mair has analysed current approaches and classified them according to the theoretical and pedagogical concepts drawn from Modern Language research. To achieve this, she has drawn on research conducted by fellow postgraduate students and brought together a range of different perspectives on theory, history of language teaching and methodology, supplemented by her own insights into the field. She has demonstrated that much current Latin teaching practice can be classified as behaviourist and structuralist with a heavy emphasis on cognitive skills, but shows very little evidence of developments in modern language teaching which focus on interaction, context, collaboration and emotional response and have been strongly influenced by a Vygotskian sociocultural theoretical perspective. Mair therefore sought out examples of Latin teaching and learning that resembled more closely the situation in modern language teaching where interaction through oral communication involving both speaking, listening comprehension and negotiation of meaning in the target language is a regular component. She found them in the form of a week-long ‘immersion’ programme at Lexington in the USA. This ‘Conventiculum’ proclaimed the benefits of learning Latin through interaction in Latin and collaboration with other learners as well as interaction with original texts, though once again this seemed to be based on an intuition of the benefit rather than having a firm theoretical perspective. As a participant observer at this event, Mair was able to gather data on the experience of beginner and more experienced learners, including her own reactions, to their ‘immersion’ in Latin and the types of activity and interaction and they engaged in. Data collection at the Conventiculum included asking participants to read a short passage in Latin and to make a drawing of what this passage evoked for them. They were asked to do this both before and after the event. They were encouraged to envision the scenes described in the passages without making a translation into English. This represented an innovative way to examine readers’ responses to the passages. It enabled readers to avoid the mediation of another language (as would have been the case if comprehension questions in English were given) or adding complexity by questioning in Latin. It also allowed a more personal response to the text. Readers noted the mood of the scene evoked, for example. This method has not been employed to any extent in modern language learning, where despite attention to so-called ‘intensive’ and ‘extensive’ reading (for specific information or for gist), there has been little attention to reading and understanding entirely within the target language and in understanding what is meant by ‘engagement’ in reading. In her analysis of the data gathered from the communicative Latin teaching and interpersonal interaction in Latin at the Conventiculum, Mair explored the explanatory value of a Vygotskian sociocultural theoretical perspective (as applied to modern language learning). Her findings indicate that this may be a positive way forward in understanding how reading in Latin and engagement with original texts can be facilitated and become more enjoyable for learners of Latin and other ancient languages. On behalf of the OU Classical Studies department and CREET, and especially from the four of us who supervised you, congratulations Mair, and bona fortuna! As Uschi put it at the AOUG Award Ceremony, Mair fabulosa est! This entry was posted in Conferences, Fieldwork, Ideas, People, PhD, Postgraduate student profiles, Teaching and tagged Awards, Latin, PhD on November 18, 2016 by Eleanor Betts. What’s the best way of celebrating the end of the academic year at a distance-learning institution like the Open University? We can’t exactly take all our thousands of students to the pub (! ), so we need to think creatively about how to collectively ‘wind down’ after the end of exams… as well as how to support students as they start to think ahead to their next modules or qualifications. 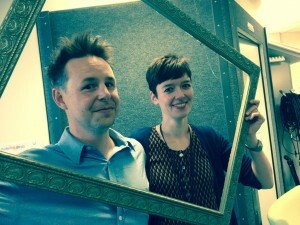 This year, the Arts Faculty tried something a bit different – a two-day academic Arts event that was broadcast live from a studio on the OU campus in Milton Keynes. The ‘Arts Student Hub Live’ (Friday June 10th – Saturday June 11th) involved a team of producers and OU staff and students getting together to create a jam-packed programme of live chat shows, quizzes and interactive ‘study support’ sessions – all designed to help our Arts and Humanities students take stock of their achievements over the past year, and find out more about the various subjects, modules and degrees offered in the Arts & Humanities programme. It’s difficult to express quite how much fun and hard work it was putting the event together, but you’ll be able to get some inkling from the videos on this webpage. Our main Classical Studies session involved Jess Hughes and Henry Stead rustling up a lunchtime ‘Classical picnic’, which they shared with the Hub presenter Karen Foley and her pet rhinoceros. Radishes, retsina, dates and Ambrosia rice pudding were just some of the delicacies that we used to showcase the diversity of Classical Studies and introduce our tempting undergraduate curriculum. Other sessions with a classical theme included Henry’s talk about Creative Writing, and Jessica’s discussion with Dan Weinbren about ‘Myths of the early OU’ (think Pygmalion and Educating Rita). We’ve embedded those three videos here, but you can find all the sessions from the event on the Student Hub Live website. And if our picnic video inspires you to learn more about our Classical Studies modules, you might like to try some tasty taster materials on our department website. ps. The Student Hub Live is on Twitter. Follow @StudentHubLive for notifications of future events. 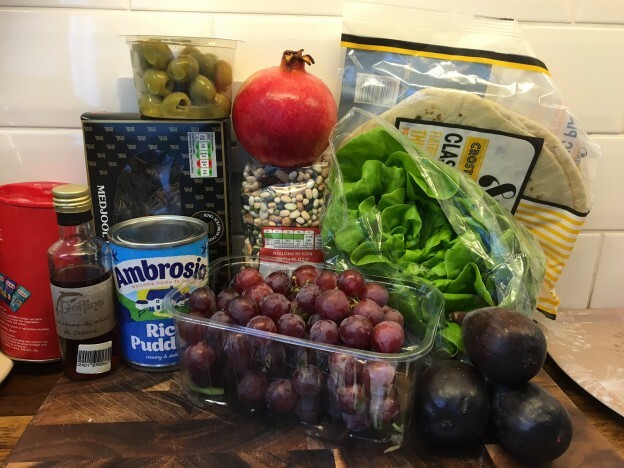 This entry was posted in Teaching and tagged food, fun, Open University, part time study, Student Hub Live on July 12, 2016 by Jessica Hughes. A former student commented, ‘seriously I still find myself quoting this mantra. I remember in the Anc Med exam looking round & seeing people muttering this.’ But I can go further. I’ve picked up some techniques along the way and I’ll share some of those here. They worked for me, and maybe they’ll help you too. 1. Breathe. Don’t panic. I used to do my panicking a few weeks before the exam, so by the time I was sitting in that hideous gym or hall I was past all that. But even so the first five minutes were hideous, as those around me turned over the question paper and immediately started to write. Do you know what? These people are writing complete rubbish. They haven’t read the questions; they’ve just spotted a word and gone into overdrive. Don’t follow their example. Sit back. Read the questions. Circle or underline some words. If the questions aren’t what you hoped for, never mind – there will be something you can answer, and possibly you’ll produce a better argument simply because you are thinking rather than regurgitating. Look at the person next to you – wow, on to their second page now! – and feel sorry for them because they aren’t answering the question. After five minutes of thinking and breathing, start to write your plan. 2. Read the question carefully. Questions aren’t written to catch you out, but to help you think about the course material. No question will ever be ‘Tell me everything you know about…’ but some answers will be to that question, rather than to the one being asked. The more obvious questions aren’t always the ones to answer, because your words of wisdom are going to be compared with some very good answers as well as some rather iffy answers. But nor do you want to be the only one answering the question – an examiner is unlikely to give you a top mark without seeing from looking over the field that you really are the front runner. Ideally, you want to be one of a group of answers in which it’s clear that yours is the best. That may mean picking the question carefully. And, unless you read it, and think about it, and make a list of the main points to cover and the examples you could use in answering it, you’re not going to get that right. 3. Passing exams isn’t entirely about what you know, but how you present it. There’s a lot to be said for that boring old structure of an intro saying what you’re going to say, three or four paragraphs each focused on one example which contributes to answering the question, and then a conclusion which pulls the examples together to make that answer very clear. So that rough plan you wrote in the five minutes while those around you failed to address the question must address the key words in that question. By all means, leave some lines blank, then write the essay and go back to do your intro. But in many situations you can do the intro first, on the lines of ‘in order to answer this question I am going to do the following/examine these cases’. 4. Give the examiner something a little different. At university I made a conscious effort to include in each exam script at least one point from a course other than the one being examined. I reckoned this would liven things up for an examiner faced with their fifteenth – or fiftieth – answer to that question. It also showed I could make connections between subjects, and that has to be good. Avoid too much creativity here – a friend at university made up a whole tribe for an Anthropology exam – but a confident and accurate mention of something that wasn’t part of the syllabus looks good. If you have a really bad exam, don’t write a letter to the examiner apologising for your poor performance (yes, I’ve seen those). And don’t take a banknote out of your pocket and reproduce it on the answer book (yes, I’ve seen that, but only the once). There’s ‘different’, and there’s ‘no’. 5. Leave 10 minutes at the end to read through your answers. In exam conditions it’s very easy to write ‘Romans’ when you mean ‘Greeks’ or to miss out the word ‘not’. Reading through will also give you a chance to make your handwriting a bit clearer if you’ve been in a hurry. If you can’t read your own writing, the examiner hasn’t a chance. 6. Go home. There’s little point hanging around as people share what they wrote for each question. Thinking ‘Oh no, I totally misunderstood that one!’ or ‘Why did I forget that brilliant example?’ will only depress you. Onwards to the next exam, after a well-earned sleep! This entry was posted in Teaching and tagged exam, exams, revision, study skills on May 11, 2016 by Emma Bridges. Tony Keen is a long-time Associate Lecturer for the OU, and an Honorary Associate. 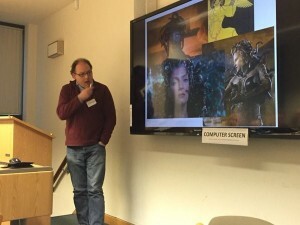 This post is based on a talk he gave at the Classical Studies Associate Lecturer Training and Development Day in November 2015. In the sixteen years I’ve taught for the Open University, I’ve often used movies and television as part of my teaching strategies, and this is just as true for the current module I teach, A330 Myth in the Greek and Roman Worlds. 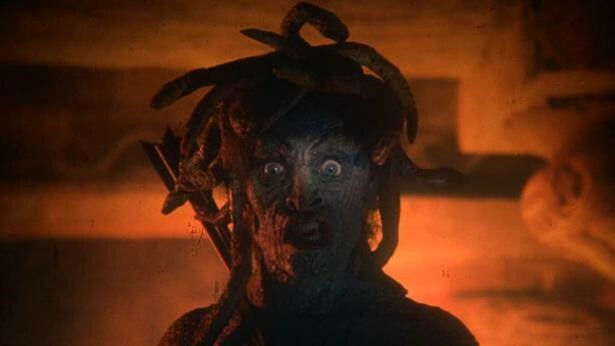 Some of these approaches are obvious – if one wants to talk, for instance, about the Gorgon Medusa, it makes sense to show how the cinema has represented her, in movies such as the 1981 and 2010 versions of Clash of the Titans. Such clips can show students that they actually know something about changing depictions of mythological characters. But it’s also possible to be a bit more imaginative. In the collection of Fables attributed to the Greek slave Aesop, there is found an early version of the tale of the town mouse and the country mouse, probably most famous to classicists in the version found in Horace’s Satires 2.6, lines 79-117. The story is simple. A country mouse is invited to dine with his cousin in the town. The town mouse lays out a splendid table, full of gourmet delights that the country mouse simply can never experience at home. But then the party is disrupted by dogs, and the country mouse decides that, for all its simplicity, his home offers security not to be found in the town. 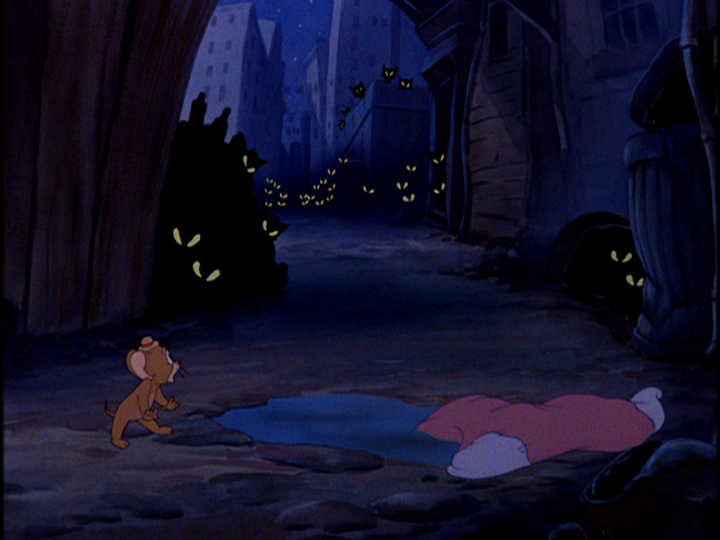 In 1945, Metro-Goldwyn-Mayer produced the nineteenth cartoon in their cat-and-mouse series Tom and Jerry, ‘Mouse in Manhattan’, directed by William Hanna and Joseph Barbera. It’s an unusual entry in the run. Instead of the usual mayhem caused by Tom’s unsuccessful attempts to catch Jerry, the premise is that Jerry, bored with life in the country, sets off for the bright lights of Manhattan, leaving a note for Tom (who is otherwise barely present). The rest is taken up with Jerry’s adventures in New York, and the dangers he faces. There is no town mouse to equate with Jerry’s country mouse, and the existential threat that drives Jerry back to the country is feral cats, rather than dogs. But the fundamentals of the fable are here, and whilst I am not suggesting that Hanna or Barbera had necessarily read Horace or Aesop (they may have, or they may not), they almost certainly had encountered the story in some form. It has, after all, been much repeated through history; Beatrix Potter retold it in The Tale of Johnny Town-Mouse, and in 1936 Walt Disney had overseen a Silly Symphonies short called ‘The Country Cousin’, which adapted the fable more faithfully than ‘Mouse in Manhattan’. One effect of showing this to students is to put them in a good frame of mind – who doesn’t enjoy a good Tom and Jerry cartoon? But it also demonstrates how stories are transformed as they are repurposed, and also makes the original fable seem less remote to students. Fable is not often dealt with in myth courses. What can using cinema bring to wider understanding of what is more traditionally understood as ‘mythology’? One issue that can confuse students is that various different versions of myths proliferate through antiquity and beyond. Does Hippolytus die at Troezen, or is he reborn as Virbius in Italy? Who kills Medea’s children, the Corinthians or their mother? I explain this through the modern phenomenon of rebooting screen franchises. 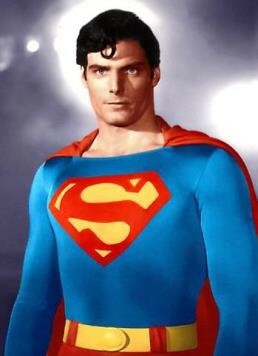 There are several screen versions of the superhero Superman, with different versions of when and how Kal-El arrived on Earth from Krypton, and his early life. Similarly, the James Bond movies were rebooted in 2006 with Casino Royale, showing Bond’s first mission as a 00 agent. All previous movies were disregarded, and elements from those, such as the terrorist organization SPECTRE, could later be reintroduced. Cinema audiences cope with this perfectly well, so what is the problem with Euripides’ three incompatible versions of Helen of Troy? 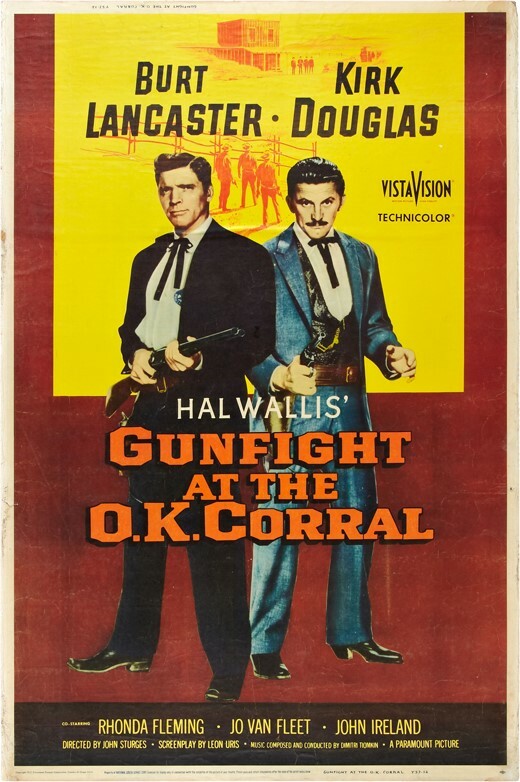 My most unusual use of cinema to teach myth is when I show students two versions of the 1881 Gunfight at the O.K. 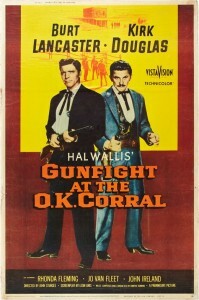 Corral, in 1946’s My Darling Clementine, and 1957’s Gunfight at the O.K. Corral. I ask the students to note significant differences between the two (for instance, Doc Holliday dies in the gunfight in the former, and survives it in the latter). I then show how the two versions relate to what actually happened, and explain that while the later movie is a little more true to the events of 1881, nevertheless both fictionalize extensively. My point is to show how fictionalized and mythologized versions of historical events can depart from what actually happened, in different ways in different versions. So it’s almost impossible to use a fictionalized account to reconstruct a putative historical event when historical records don’t exist, and students should be suspicious when that is attempted, as it often is with Homer’s Iliad and the Trojan War. Hopefully this will spark further ideas of how to use cinema in teaching. Let us know in the comments what you do. Editor’s note: Tony has also produced various Open University learning resources which you can access for free via OpenLearn here. This entry was posted in People, Teaching and tagged cinema, classical reception, film, myth on April 15, 2016 by Emma Bridges. “Like most ALs, I’ve had a varied career, as entertainments manager, city accountant, teacher, examiner, editor, online shop manager and European tour guide but, without doubt, my most fulfilling and interesting work has been (and still is!) working as an OU AL. I have wonderful tutor groups full of keen, committed students from varied backgrounds and we study fantastic OU materials. Both these materials and the students’ responses to them are stimulating and enlightening. As a tutor in the London Region, I get to meet a good proportion of my students face-to-face, which is always exciting. However, as for all ALs, my main work is guiding the students through their studies and keeping them on-track by marking their assignments (TMAs = tutor-marked assignments) and here I have a slightly embarrassing confession to make: I have always enjoyed marking my students’ work and actually look forward to each batch of TMAs. It’s not that I don’t enjoy the more obviously attractive aspects of teaching such as face-to-face tutorials, but I have always liked seeing students’ own work and believe that prompt, positive responses to this is what helps them most. Even as a school teacher I used to mark students’ work as they were actually producing it in the classroom, keeping them on appropriate paths. Each student responds individually to their studies and respecting and acknowledging this through feed-back on their work is what benefits them. In many ways my editing work in publishing was a type of marking and inevitably this affects my marking of students’ TMAs, making me perhaps a tad over-keen to add apostrophes and colons etc. It’s the Lynne Truss in me trying to steer students clear of Eats, Shoots and Leaves, though I warmly remember one pupil’s account of ‘red hot saliva’ rolling down Mount Vesuvius and I always smile at mentions of ‘Media dominating the agenda’ in Euripides’ tragedy. 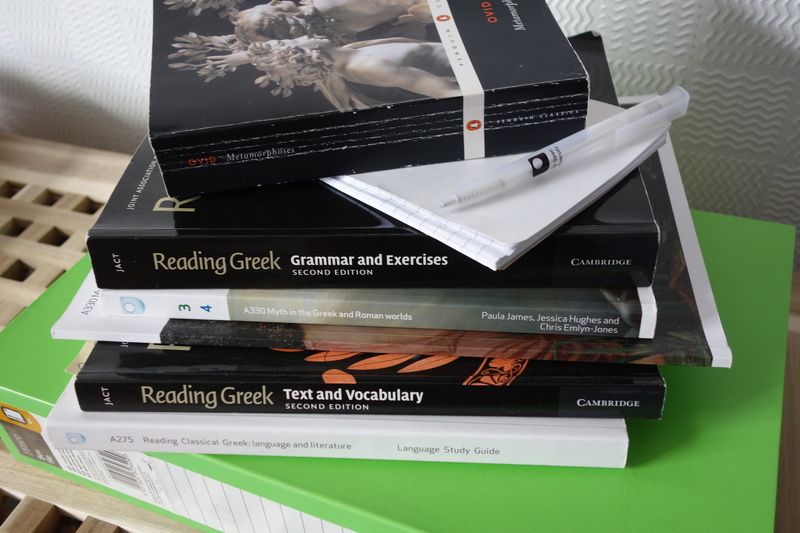 The OU offers tutors many opportunities and treats and I make good use of these, offering language taster sessions in R01 in Greek and Latin and working as forum moderator, TMA setter, exam/ETMA marker and TMA monitor. This means I get to look at other tutors’ marking of TMA assignments and learn from their approaches. It is always striking how important the tutor’s personal touch is, and how the PT3 form can be used to acknowledge a student’s individual strengths and issues. One of the great advantages of living in London is that there are loads of great theatres on the doorstep. 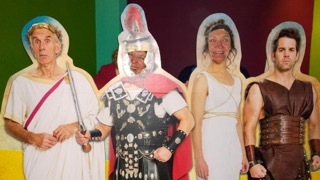 Last summer we were treated to a cavalcade of Greek tragedy and this Christmas it was the turn of the Romans, with Ben Hur at the Tricycle. This pantomime for grown-ups has now finished at the Tricycle but it will surely move on to the West End, as their previous small scale epic, 39 Steps, did so successfully. If so, do try to see it. It may owe more to Michael Frayn’s Noises Off farce than to Plautus or Terence but it is a wonderful pastiche of General Wallace’s epic novel, with its slightly lumpen conversation style, and the epic film, complete with chariot race powered by lawn mowers. This entry was posted in People, Teaching and tagged teaching, theatre, TMAs on January 25, 2016 by Jessica Hughes. – Sasha, who lives near Leicester, told us that, with four young children and another on the way, the OU enables her to combine studying with raising a family in a way that would not be possible via a ‘brick’ university; having enjoyed the classical elements of the OU’s interdisciplinary Level 1 Arts module (in which students encounter, among other things, Sophocles’ Antigone, Plato, Cleopatra and Roman archaeology) she has decided to pursue a single honours Classical Studies degree. – Several students cited a lifelong interest in ancient Greece and Rome as their inspiration for beginning formal study. Brian recalled a school trip to Chester and studying Latin at ‘O’ Level in the 1970s as fuelling his enthusiasm, and, having studied several history modules with the OU, is now embarking on Exploring the Classical World, our wide-reaching Level 2 module which introduces our students to the literature, history and culture of ancient Greece and Rome. Trevor, who is studying the same module from his home in the Scottish Highlands, told us that he’s been studying with the OU since 2013; he’s enjoying reading all manner of ancient texts and plans to go on to study our Level 3 module Myth in the Greek and Roman Worlds next year. Another of our students, Alisha, lives in Switzerland, and dropped in to tell us that she’ll be studying the myth module along with our brand new Level 3 module The Roman Empire. Philip in west Wales, meanwhile, is a local guide who spends a lot of time talking to tour groups about the Roman heritage of his town, so he’s joined us in order to find out more about the Greeks and Romans. – Our new Level 2 Latin module, which we are offering for the first time this year, has been eagerly anticipated, and we met several students who are looking forward to learning the ancient language. Among them are those for whom the study of the language offers them the opportunity to enhance their understanding of the ancient world, and others who plan to study Latin as a way of complementing their knowledge of a variety of modern languages. – Meanwhile we also give our students the opportunity to learn ancient Greek, with a module which teaches the language from beginners’ level as well as allowing students to gain a deeper understanding of some key literary texts by reading them in translation. Gale told us that, having retired after a long career in the NHS, she now has the time to take up formal study; she confessed to feeling a little daunted by the challenge of studying ancient Greek but is fascinated by the ways in which the ancient world continues to influence our own society. If you’d like to know more about what we offer please visit our departmental website, where you’ll find information on our modules and courses (at both undergraduate and postgraduate level) as well as free taster materials and contact information. Wishing all our students the very best of luck with their studies for the coming year! This entry was posted in Teaching, Undergraduate student profiles on October 7, 2015 by Emma Bridges. Even if you’ve never studied with the Open University before, you’ll probably be aware of the central role that audio-visual materials play in our teaching resources. In fact, from the earliest days of the university (which was established in 1969), the image of the OU broadcast, delivered by a kipper-tie-wearing lecturer and screened on the BBC at some ungodly hour, has become a fondly remembered (if sometimes gently ridiculed) feature of our teaching. But we’ve moved a long way past these stereotypes now. Today, our modules offer an exciting variety of audio-visual resources, from short documentaries filmed in exotic locations to intimate discussions between academic experts. Everything is carefully planned and integrated with the rest of our study material so as to support students in their studies as effectively as possible. It’s hard work, but it’s also one of the most interesting and rewarding tasks for those of us working on modules in production – and with an unprecedented number of new modules about to be launched by the Classical Studies department, we wanted to take this opportunity to give you some more insight into just how this process is carried out. I’m the chair of the new Latin literature and language module, Classical Latin: the language of Ancient Rome (A276), which will have its first presentation in October 2015. Earlier this year, the module team finished work on a whole suite of audio features which will be interspersed throughout the three Blocks of the module. A few of them are specifically designed to support the language sections – so, for example, students will be able to hear the Latin texts of some of the literature that they will be studying spoken out loud – but the majority are related to the module’s literary and cultural units. A276 focuses on literature written in the Augustan period, from Livy’s histories of early Rome, to Virgil’s Aeneid, to the love poetry of Ovid, and addresses the central theme of how such texts were vehicles for exploring Roman identity. The units that we’ve been writing, as part of the core teaching materials, offer lots of different angles on this – but sometimes, the best way of bringing these texts and the debates around them to life is to talk about them. So, from an early stage in the module’s production, we’ve been working with JustRadio, a production company who have a great deal of experience with the OU, as well as in making programmes for the BBC and other broadcasters. They’ve helped us to identify what sort of features would be most useful and interesting for our students, and have enabled us to really get the best out of our material. At the heart of many of these features are conversations with leading academics and professionals, from a discussion about epigraphy with the Cambridge classicist Mary Beard, to an on-site interview with a botanist at Kew Gardens who regularly uses Latin in her day-to-day work. One of the most memorable was a 20-minute piece that we put together for Block 3 of the module, in which students spend some time thinking about the process of translation. I went to King’s College London to interview two academics about their views of translation: William Fitzgerald talked about the scholarly side of things, and the history of different kinds of translation, while Henry Stead gave us an insight into his own practice as a translator of Latin literature. Conducting the interviews in their offices was just the first step, though. Next, my own introduction and links had to be recorded in studios on Wardour Street, Soho (a historic centre of film and radio production in the UK), where I was closeted in a tiny booth behind glass, feeling like I might have been about to read the news on the Today programme. And finally, JustRadio edited these links and the conversations into a seamless piece of audio, interwoven with clips of Henry’s recital of his own poetry, along with archive material of the poet Ted Hughes reading from his ‘Tales From Ovid’. The result is, we think, a really engaging way of getting students to think about what’s at stake when we translate, as well as providing an opportunity to listen to different ways of performing poetry. JustRadio helped us to find other ways of bringing Latin literature to life, too. Not wanting to be outdone by the exotic trips undertaken by our colleagues working on A340, our new Roman Empire module, we also found space in our schedules for a quick trip to Rome. Not merely an excuse to sample pizza and gelato, this turned out to be a real boost to some of the audio features that we wanted to include in the module’s earlier blocks. 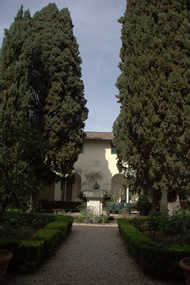 It gave us the opportunity to speak to people like Chris Smith, Director of the British School at Rome, about his expert knowledge of early Rome, along with Diana Spencer, a leading scholar of Augustan literature – but it also provided crucial atmosphere and a sense of location for our own discussions of Augustan Rome. We didn’t really believe it until we heard the first cuts of the features ourselves, but it was so much easier to conjure up the importance of what was happening in the city of Rome itself when all this great literature was being produced, when we could connect our discussion to a real geographical location – and hopefully our students will feel a sense of our excitement too. Now that the long process of writing and interviewing, editing and mastering is over, all that remains is for us to unleash our efforts on our first cohort of A276 students. If you’re interested in being among them, and would like to know more about what this module has in store, then our short introductory audio is online now, and you can read more about it on the OU website, too. This entry was posted in Teaching on July 7, 2015 by Joanna Paul.